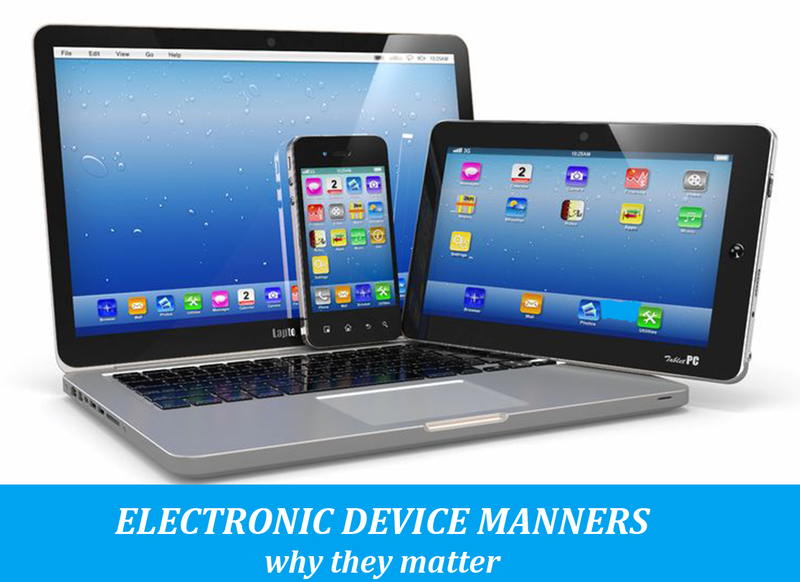 Electronic device manners are vital to teach our kids. Adults and kids use these devices daily in personal and professional lives. Infants stare at iPads. Toddlers can change settings on iPhones. Teens have become so inseparable from their devices that many schools have changed their policy about allowing kids to use devices in classrooms. Look around in restaurants or even at your children’s’ sporting events….everyone is on their phone! Emails, Facebook, Instagram, Twitter. You name it. We each have our favorite ways to interact online. Electronics seem to be as important as breathing. Because of this blossoming epidemic with near-constant use of electronic devices, there has been a growing concern about the impact on the development and health of children. Debates about appropriate amounts of screen time for kids have been discussed for years. Recently the Academy of Pediatrics has issued an updated statement where they have lessened rigid recommendations. That is not the point of my discussion. I believe, as in all aspects of parenting, that there is no correct way to raise a child. However, I believe something has become lost in this electronic device debate. There needs to be rules and a code of conduct for using these devices. Over the past 25 years, as a pediatric surgeon, I have witnessed the onslaught of near-constant screen time required by my young patients. And I have watched overwhelmed parents become powerless at controlling the need their children have for their devices. Rules. Manners. Etiquette. Part of our job as parents is to instill into our children the ability to use good behavior. Electronic devices are no different. I remain confused why such a large number of parents have not taught their kids electronic device manners. It is disruptive when your child must use electronic devices at all times, with a loud volume. The uncontrollable meltdowns and temper tantrums when you attempt to take them away are predictable. These situations can be a problem in any aspect of your life, but they are particularly disruptive at your doctor’s office. As a pediatric specialist, I fully understand the challenges of getting kids to sit still while waiting to be seen by their doctor. Electronic devices are as invaluable today as the old school crayons and coloring books that I carried around for my daughters. When it is time for children to be examined, they should already understand the device will be turned off. This should not be a surprise. Every day, I witness the most full-on, rolling on the floor, temper tantrums when children as young as 18 months old have electronic devices taken away from them. Parents must keep working on manners and teaching children electronic device manners. Recently, I have been spending increasing amounts of office visit time dealing with poor electronic device manners. If a child speaks and interrupts me while I am talking, parents are quick to stop that behavior. But I have noticed a lack of effort to control children’s poor electronic device manners. These electronic distractions make it difficult for parents to understand I am telling them about the possible need for surgery. Parents often miss the reason for my decision and alternative options. Regardless of the age of your child, I encourage parents to teach children electronic device manners. 5 electronic device manners to parents need teach children now. 1. Learn to play or watch devices with no volume or kiddie headphones. This is rarely an issue with older kids who walk in with their sweatshirt hoods up and earphones in place. However, young kids are used to playing games with the volume turned up, which is disruptive when doctors are trying to talk over the noise. This situation is magnified when each sibling in the room has a separate device, with competing volumes. Parents want their children to avoid talking while the doctor is speaking because this allows them to focus on the medical discussion. Parents should also want the device volume turned off so they can listen to the doctor. 2. Learn to have the device put away without having a meltdown. Quietly playing with a silent device is great during the visit when we are talking about the history of the medical problems. However, at some point, an examination is needed. When I try to look at your child’s nose or mouth and the device cannot be put down, it is a problem. It results in what I call the Device Dance…I move up and they move the device up with me. It is as if a string is attached between their faces and the screen. If you have not practiced having devices randomly removed and teaching your child that they will survive, getting good examinations from the doctor becomes an issue. 3. Learn that their siblings will continue to use devices while they are being examined. This may sound trivial, but trust me it is not. It is one thing for children to learn that it is time to put away their favorite electronic device, but it quite another thing for them to watch their siblings continue to play. Parents need to establish rules that either all children will put away devices at the same time or that the child who is being examined will be the only one to not have use of the device. Whatever your parenting style is, make it known to your kids. I have watched in fascination while parents try to teach these lessons in my office. It is not pretty. 4. Learn that every wall outlet is not theirs to use. Permission is needed. I understand that batteries run out of power, but going back to rule #2, children should have the ability to go without using the device for short periods of time. If you feel your child needs the device, please charge it in the car before you arrive. Never, ever unplug or remove child safety caps on outlets. Many parents have told me they do not feel that this is an intrusive action, but trust me it is. 5. Learn that free wi-fi is not everywhere. I understand that increasing numbers of businesses offer free wi-fi. I agree that it is a legitimate question for your child to ask…one time. After your children are told that they cannot have the wi-fi password, you need to remind them that everyone does not allow access to their wi-fi network. Repeatedly interrupting the doctor asking why they cannot get the wi-fi code is poor electronic device manners. Explaining why they really, really need to use wifi is not effective and is a waste of office time. I love my job and wouldn’t trade it for anything else. I understand that there is a constant need to reinforce rules and to set clear expectations for manners and good behavior. Parenting is not easy, and screen time does bring some welcome relief. Just be aware that there is a time and place for these devices, and you, the parent, need to decide when that is. Not your child.